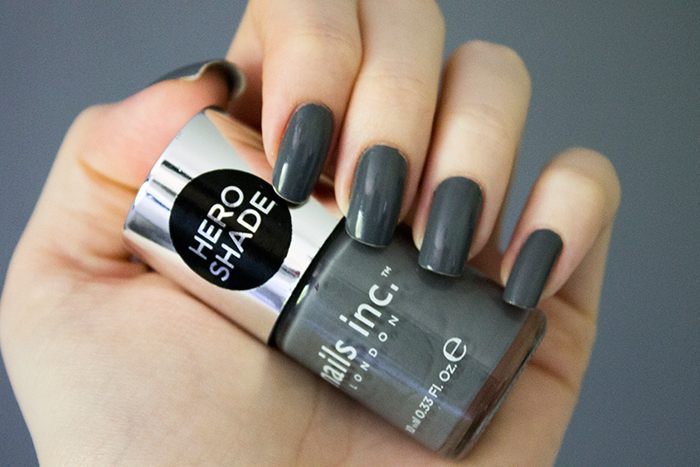 If there's one colour that's underrated in the nail polish world, it's grey. While it might not seem all that exciting, it's one way to go neutral without going the traditional clear/pale pink route. While I do have a few grey's in my collection, one that I've been loving recently is Nails Inc The Thames. Here's what I think of it. The Thames is a slate grey shade with a glossy finish. It's one of those shades that you probably wouldn't pick up on first glance. Once applied on the nails, it has a real classy look about it. It's a much softer colour than your average black and still bold enough to make a statement. As with most nail polish shades in the Nails Inc line, it applies beautifully on the nails, drying fairly quickly. It's no surprise it's one of their best selling shades. It's lasted really well on the nails with around 5 days wear and still no sign of chipping.. even without a top and base coat! If you're on the hunt for neutrals but want something a little different.. this is your shade.